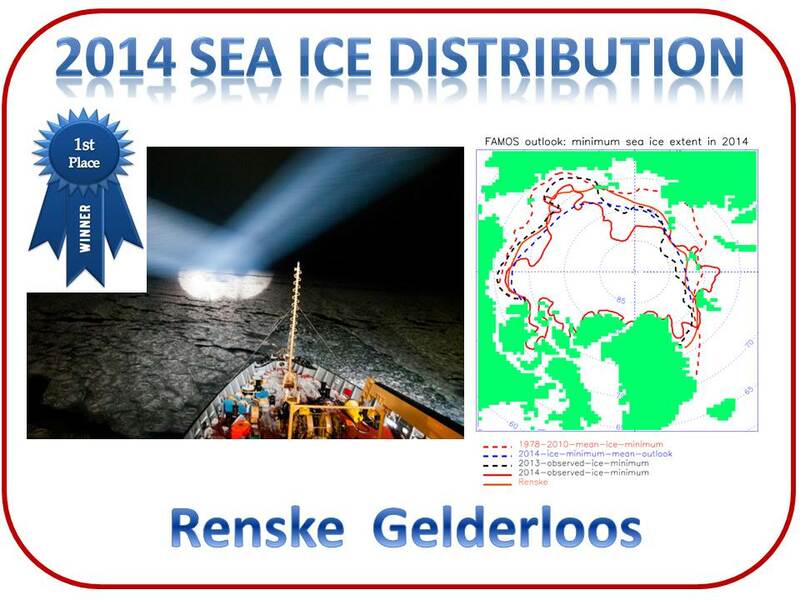 61 participants of the 2nd FAMOS workshop (October 22-25, 2013) prepared outlooks for sea ice conditions in 2014. 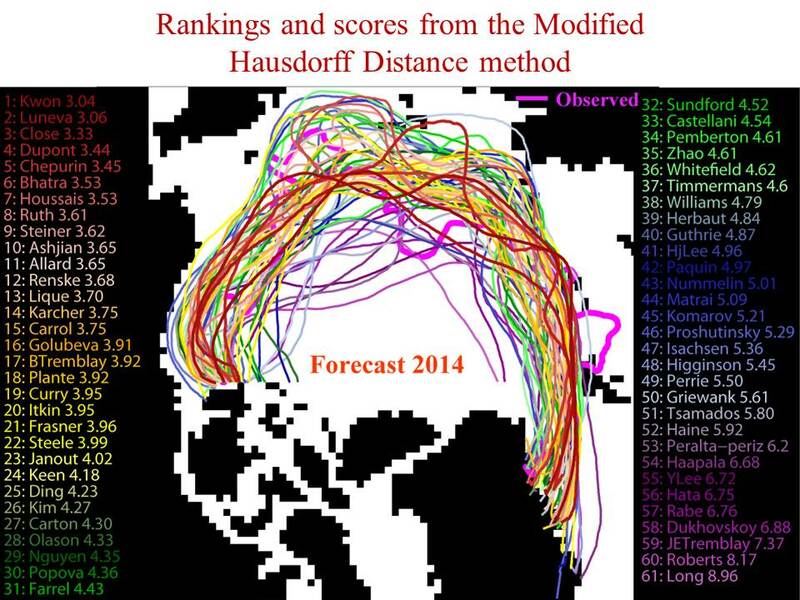 Results of these predictions will be discussed during 3rd FAMOS workshop in October, 2014. 1) Spatial distribution of minimum sea ice extent in 2014 (Figure 1). We have digitized this information from maps showing ice edge (extent) provided by workshop participants. This is summarized in Figure 1. 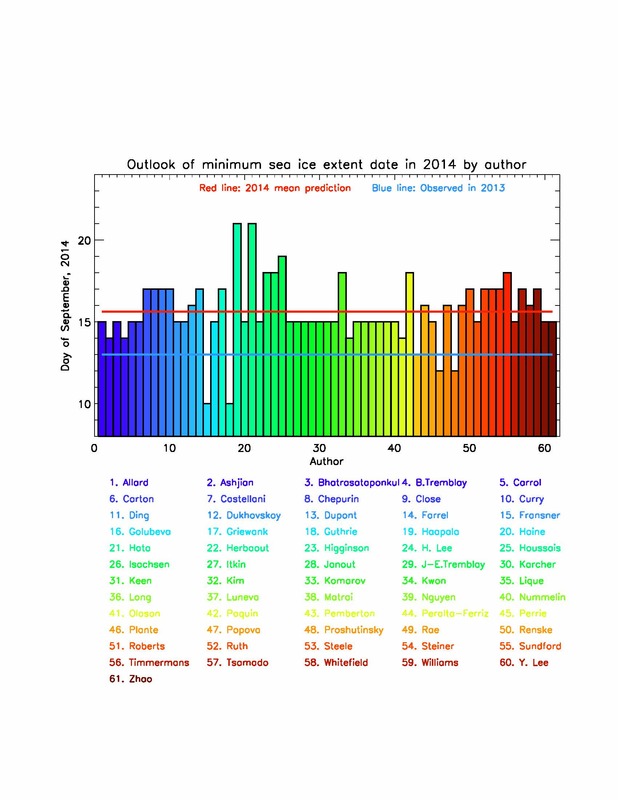 Thick blue line shows ensemble mean outlook and indicates that in average participants predict less ice in 2014 than it was in 2013. 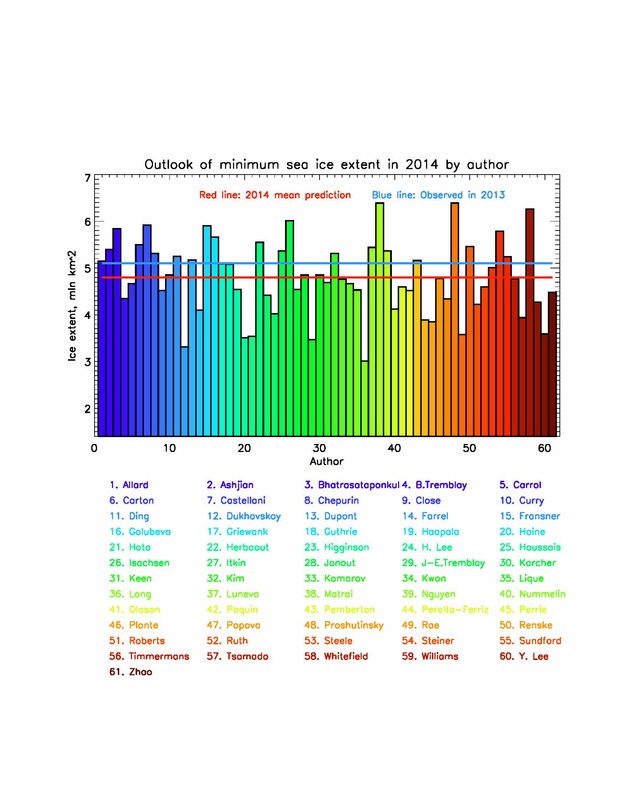 Figure 2 pdf file* shows all individual outlooks for 2014 location of ice edge for the date of its minimum extent. 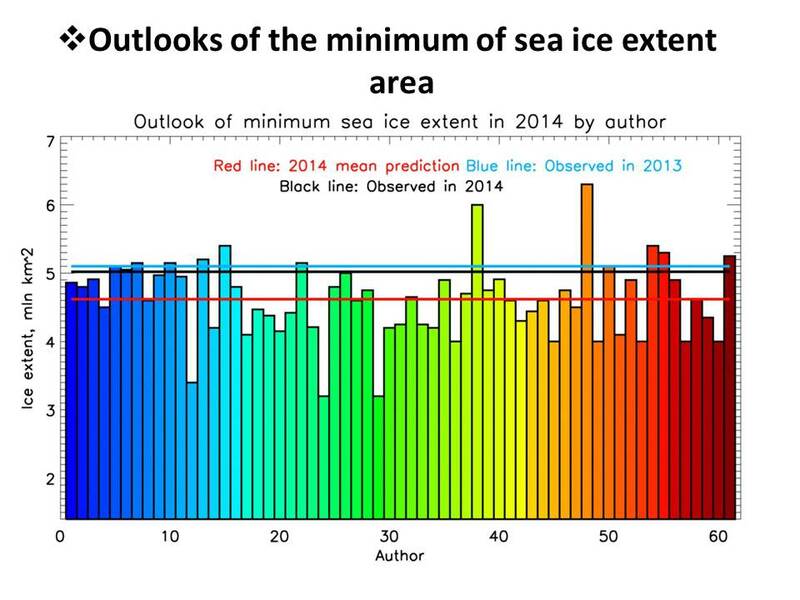 2) Minimum sea ice extent in 2014 in square kilometers (Figure 3). 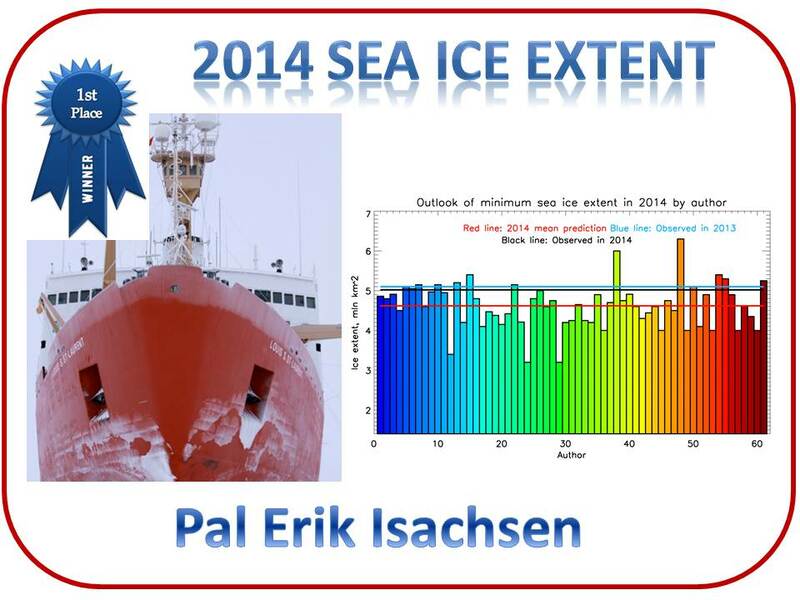 3) Date of sea ice extent minimum in 2014 (see Figure 4). 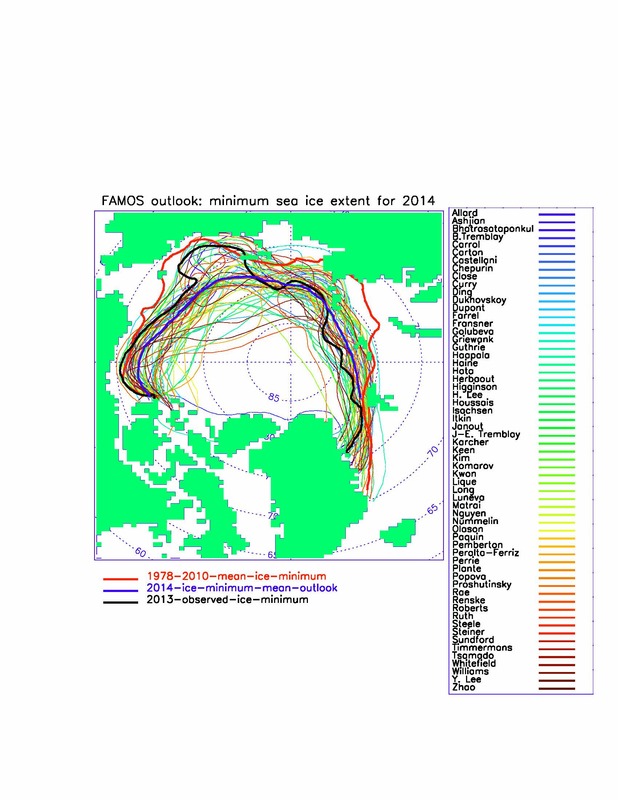 *Figure 2: Individual 2014 minimum sea ice extent outlooks. Color solid lines depecite outlooks of participants. 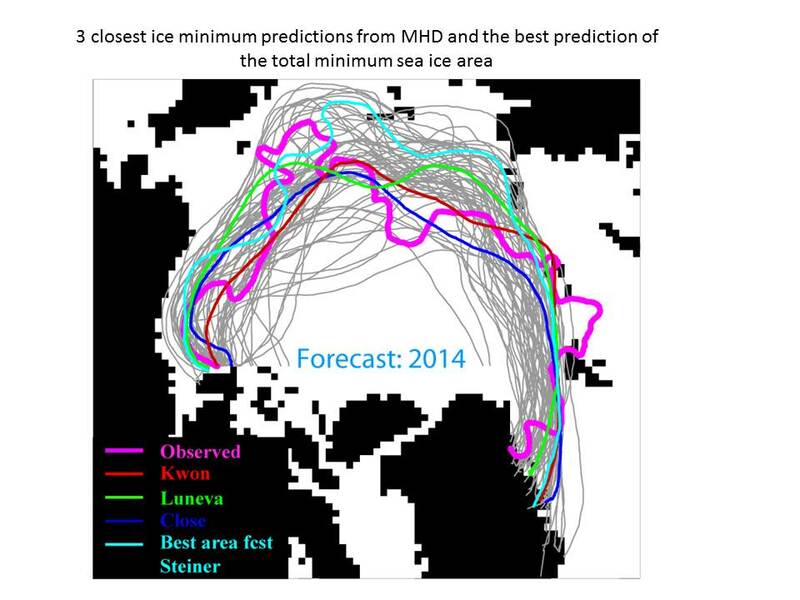 Dashed lines show 1978-201 mean minimum ice extent (red), 2014 man minimum ice extent as predicted by all participants (blue) and 2013 observice ice minimum extent in 2013 (black). To view figure 2, click here. Methods to evaluate accuracy of spatial distribution of minimum sea ice extent: this is the most difficult task to evaluate results of outlooks of spatial distribution of sea ice extent at the date of its minimum. 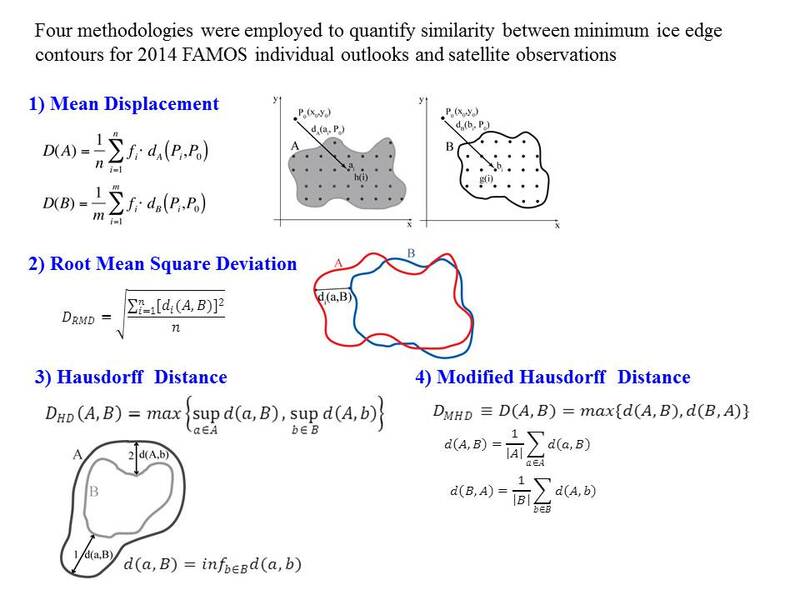 Four methodologies were employed to quantify similarity between minimum ice edge contours for 2014 FAMOS individual outlooks and satellite observations, namely: Mean Displacement (MD), Root Mean Square Deviation (MRSD), Hausdorf Distance (HD) and Modified Housdorf Distance (MHD). See Figure 5 for details. Figure 6 and Figure 7 show results of MHD method analysis. 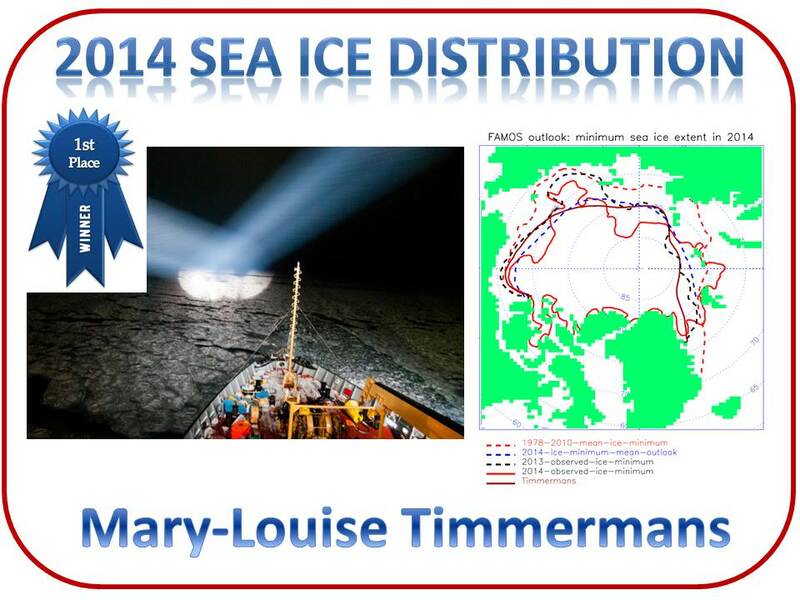 Six best outlooks were identified and winners: Maria Luneva (Figure 8), Sally Close (Figure 9), Mi Ok Kwon (Figure 10), Mary-Louise Timmermans (Figure 11), Renske Gerderloos (Figure 12) and Mathie Plante (Figure 13). 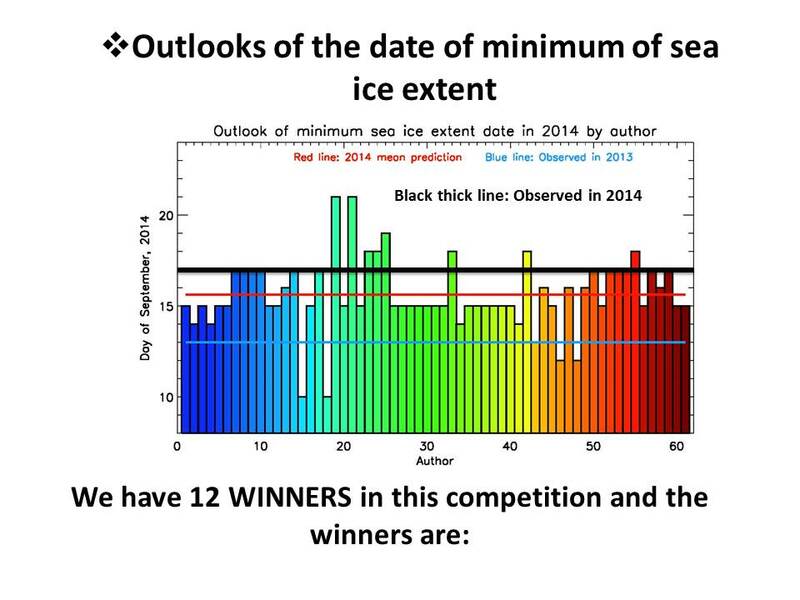 We also identified 6 winners providing outlooks of minimum ice extent area (Figure 14). Their errors in the prediction of minimum ice extent (observed was 5.02 mln square km) were less than 0.07 mln square km. The winners in this competition were Pal Erik Isachsen, Jim Carton, Sally Close, Yanni Ding, Dustin Carrol and Renske Gelderloos (see an example of their diplomas in Figure 15). 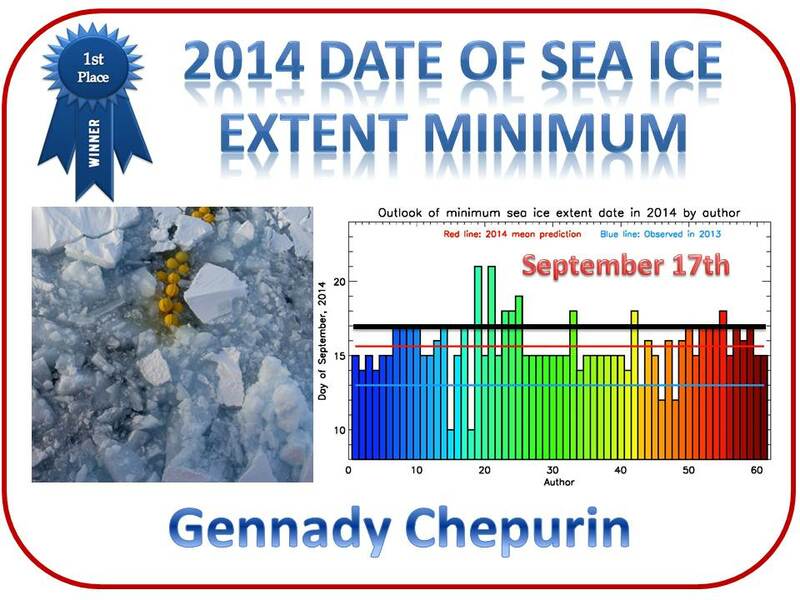 Twelve meeting outlook authors accurately predicted the date of minimum sea ice extent in 2014 (Figure 16): Gennady Chepurin, Sally Close, Beth Curry, Sinead Farrel, Nathan Grivault, Renske Gelderloos, Dustin Carroll, Mike Steele, Nadja Steiner, Michel Tsamados, Bill Willams and Giulia Castellani. (see an example of their diplomas in Figure 17).